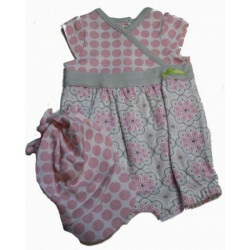 100% cotton knit preemie pink ribbon footed romper and cap by LeTop. 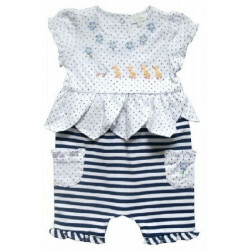 100% cotton knit footed romper and cap by LeTop. 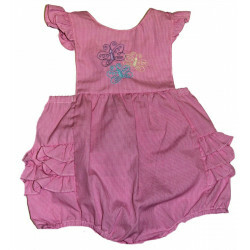 This darling pink with tiny white dots footed romper has a round neck with pico stitching and also on the bottom of the sleeves along with a ruffle. 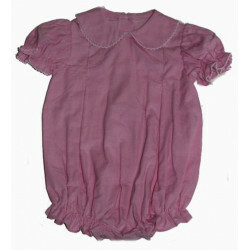 A tiny kitten is embroidered on the yoke and a pink grosgrain ribbon with bow across the front. There are little heart shaped buttons on the feet. Snaps in the back and around the legs for easy diaper changing. The cap has a ruffle with pico stitching and a pink grosgrain bow.